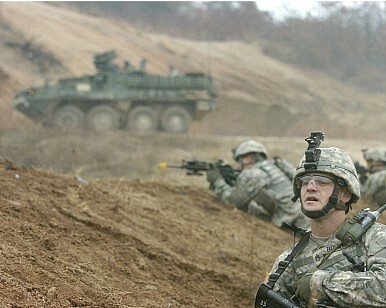 To make progress in Korea, the United States must apply security solutions to security problems. For decades, the United States and its partners have employed economic sanctions and inducements in an attempt to address the security problems on the Korean peninsula, with mixed results. While at a Korean security conference a few weeks ago, I overheard a colleague state emphatically, “It doesn’t matter if we sanction them to hell or engage them to heaven, we’ve just got to fix the problem.” This statement is very much correct in that the problem needs to be fixed, but implicit within it is the idea that the solution to the Korea problem is to be found within a narrow continuum of choices, boiled down to a set of purely economic incentives and disincentives. We’ve tried almost every point within that economy policy ladder, from the engagement of the Sunshine Policy and the Agreed Framework to the far reaching punishments of UN Security Council Resolution 2270. It has not worked, but like the old and oft cited definition of insanity, we keep trying the same thing and expecting different results. Policy toward North Korea must be recalibrated to apply security solutions to what is fundamentally a security problem, in a way that facilitates the achievement of three key American goals on the peninsula: stability, denuclearization, and reunification. These three goals are progressive in nature, with stability a precursor for denuclearization and a denuclearized Democratic People’s Republic of Korea (DPRK) necessary for national reconciliation and eventual reunification. A necessary recalibration presents itself in the joint U.S.-ROK military exercises. The exercises ostensibly exist to deter North Korean aggression, both by increasing the combat readiness of U.S. and Republic of Korea (ROK) forces and by demonstrating America’s credible commitment to its South Korean ally. Both these components were necessary to maintain effective deterrence in the past. However, the exercises have now reached a point where their utility as a negotiable concession outweighs the marginal increases gained in credibility and readiness. First dealing with the issue of credibility, the political and military coordination of the alliance is at an all-time high, and economic integration between the United States and the ROK continues to deepen with the gradual implementation of the KORUS free trade agreement. While the U.S.-ROK military exercises have contributed to the strength of the alliance, they have never been its bedrock. Rather, it is the 28,500 American servicemen and their families stationed in South Korea that demonstrate the credibility of the United States’ commitment. The continued linkage of the exercises to credibility seems to be less a matter of Korean insecurity than it is a means for domestic political leverage in both countries. The United States must remain sensitive to the domestic political constraints of its allies. At the same time, American policy has to balance those constraints with a strategy that looks to create a long term and enduring stability in the East Asia region. Second, a marginal increase in military readiness is a relatively less important piece of the U.S.-ROK alliance’s deterrent capability than ever before. Particularly since the 1990s, the conventional military balance of power on the peninsula has swung decisively in favor of the alliance. Readiness is discussed in terms of how it affects the costs of military victory, rather than the chances of military victory. While a suspension of exercises will cost more lives in the event of a conflict, a corresponding reduction in the odds of a conflict breaking out gives strategic and probabilistic merit to such a trade off from both short and long term perspectives. As a bargaining chip, the exercises are unique in their flexibility. The alliance could offer to postpone exercises; it could offer to move exercises to the southeast portion of the peninsula; it could move its table simulations to the United States; it could decrease the size of the exercises; or it could offer to end exercises outright. The size and scope of concessions can be scaled up or down as necessary, giving the alliance precision control over what sacrifices to readiness it is ready to accept and on what terms. Most importantly, should North Korea not hold up its end of the bargain, exercises can be reconvened in a matter of months. The question then becomes what could the United States receive in exchange. Freezes on missile and nuclear tests are an easy baseline, and are in line with what the DPRK has offered in the past. Denuclearization, however, is a process. The United States and Republic of Korea must consider avenues for building trust and stability with the DPRK, with policies that exist outside the typical ladder of economic policy. One possibility for such broad trust building is to demilitarize the Demilitarized Zone (DMZ). Upwards of 70 percent of the North Korean military is deployed at the DMZ, along with the much cited 13,000 artillery tubes pointed at the greater Seoul area (though the magnitude of the artillery threat is up for debate). Major demobilization and de-escalation at the border would be a first step in reducing tensions and building trust, a possibility that is perversely improved by the development of the DPRK’s strategic deterrent. Force caps or location restrictions on soldiers and artillery is one such path to demobilization. Requiring a pause in DPRK exercises is another. These are the kinds of actions necessary if we are to resuscitate trustpolitik and begin to once again move solutions on the peninsula forward. With the conventional value of the military exercises in decline, the U.S.-ROK alliance must avoid exercises for the sake of exercises. The alliance may not be dealing with another Gorbachev looking for the Korean equivalent of the Treaty on Conventional Armed Forces in Europe, but maybe it can find Kim Jong-un willing to play the part of Brezhnev in exploring Mutual and Balanced Force Reductions. Demobilization and de-escalation isn’t complete, verifiable, and irreversible denuclearization, but it’s a necessary step forward that will make denuclearization an attainable goal rather than an unattainable one. Travis Lindsay studies international security and economics at UC San Diego’s School of Global Policy & Strategy, focusing on Korean issues. Korean Peace Olympics or Game of Thrones? After the Olympics-era inter-Korean warmth comes to an end, the peninsula will have to return to the real world.